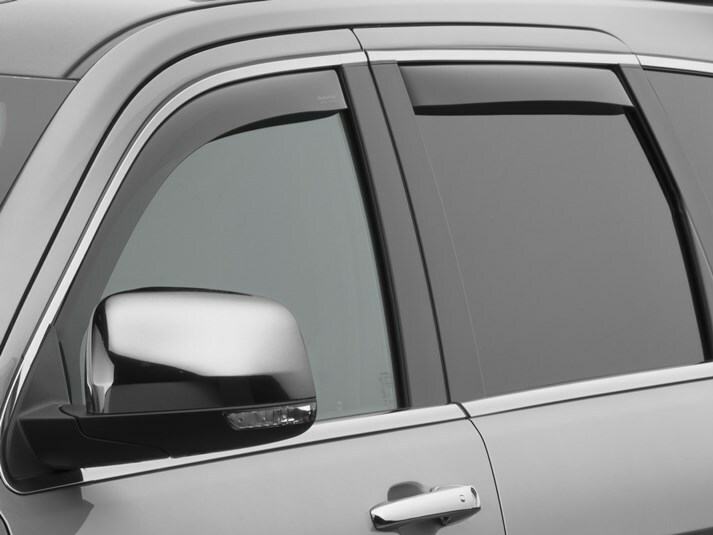 WeatherTech Side Window Deflectors are precision-machined to perfectly fit your 2012 Jeep Grand Cherokee's window channel. These low profile window deflectors help to reduce wind noise and allow interior heat to escape. Our light tinted Side Window Deflectors are the only deflectors in the world made with a D.O.T. (U.S. Department of Transportation) approved glazing material. Available in light and dark tint for most vehicles. Designed and Engineered in USA – Handcrafted in Germany. Got my side rain deflectors today and what a breeze to install. Just pop them in and away you go. No problems with product or installation. Done in 15 min. Very satisfied and would buy again. Wow! What a super quality design and material. In addition to the sleek look these vents add to my Cherokee, I just can't get over how precisely they're made for a perfect fit. Ease of installation was a snap! I had purchased a cheaper (non WeatherTech) set, and wound up with nothing but problems. Shades didn't fit right, and broke as soon as the window went up. I'm about to order another WeatherTech set for my Honda Odyssey. bought the black ones for my jeep. They look super and are great for the sun and rain. I highly recommend them. Just bought my 6th jeep grand Cherokee 2014 summit and Have ordered the window visors and bug deflector already. I have a 1998 Jeep Grand Cherokee. I have had it for about a year. The Stone and bug deflector that came on it was faded and just didn't look good anymore. So I ordered the stone and bug deflector from WeatherTech. It took only minutes to install and I was very impressed with the look and quality. The only problem I had with this Jeep is every time I cracked the front windows after it rained, all the water would roll off the roof right inside the Jeep. I was very impressed with the stone and bug deflector, so I ordered the side window deflectors. Not only are they top quality, they look awsome, and water no longer gets in my Jeep! These two products are incredible quality, easy to install, function flawlessly, and they are the best looking bug deflector and side window deflectors on the market by far! I have purchased MacNeil Side Window Deflectors in the past and when I purchased my New Jeep (4th one) I could not obtain deflectors for my model year since you didn't have designs yet. I made the mistake of purchasing In-Channel Vent Visors from another company and they haven't even lasted 2 years. The quality of MacNeil Visors are remarkable my previous Jeep still has its original Deflectors and they look as good as my new ones with no warping or cracking. Just wanted you all to know That MacNeil offers the best products for the best price, cheaper priced products are just that cheap products. Buy Quality By The Best , Buy MacNeil.